This home-smoked cocktail kit includes everything you need to bring your bartending expertise to a new level. With four different varieties of wood planks from the forests of Maine, you can try many flavor profiles to match and enhance your favorite cocktails. What is a home-smoked cocktail? 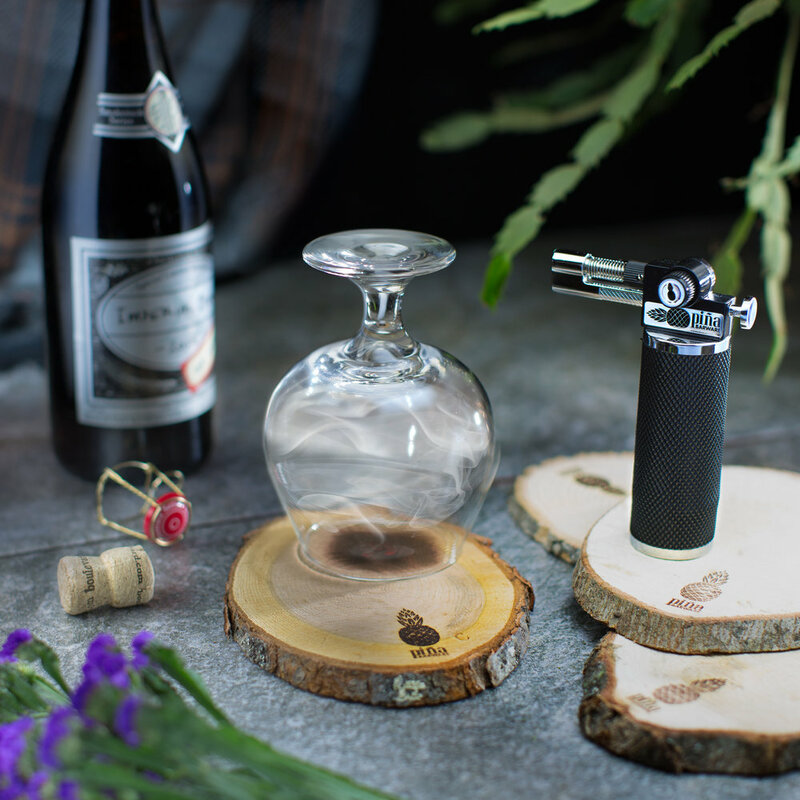 Wood-smoking has become a popular method for infusing new and unique flavors into craft cocktails. By charring an area on a wood plank, a column of smoke is created, over which a cocktail glass is placed to capture the natural flavors and aromas. After filling with smoke, the glass is inverted and the cocktail is poured over the escaping smoke. The smoke infuses and surrounds the cocktail, imparting on the drink a truly unique and complex profile. Included in the kit is a professional-grade butane torch. With a comfortable grip, responsive igniter, and continuous flame option, you'll be hard-pressed to find a better torch. In the photos, we've illustrated a few ideas to get started with the kit. From a Cherry-wood Smoked Porter to an Olive-wood Smoked Bloody Mary, the new and creative options are nearly endless. The included variety of wood is subject to change at any time, but our recent harvest included: American Sugar Maple, Portland Beechwood, Northern Red Cherry, and High-Mountain Olive. Due to the 100% natural state of the wood, the color, texture, size, and appearance of the individual planks will vary. Rest assured that none of these varying elements have any impact whatsoever on the taste or smoke quality of the wood. How will my kit arrive? 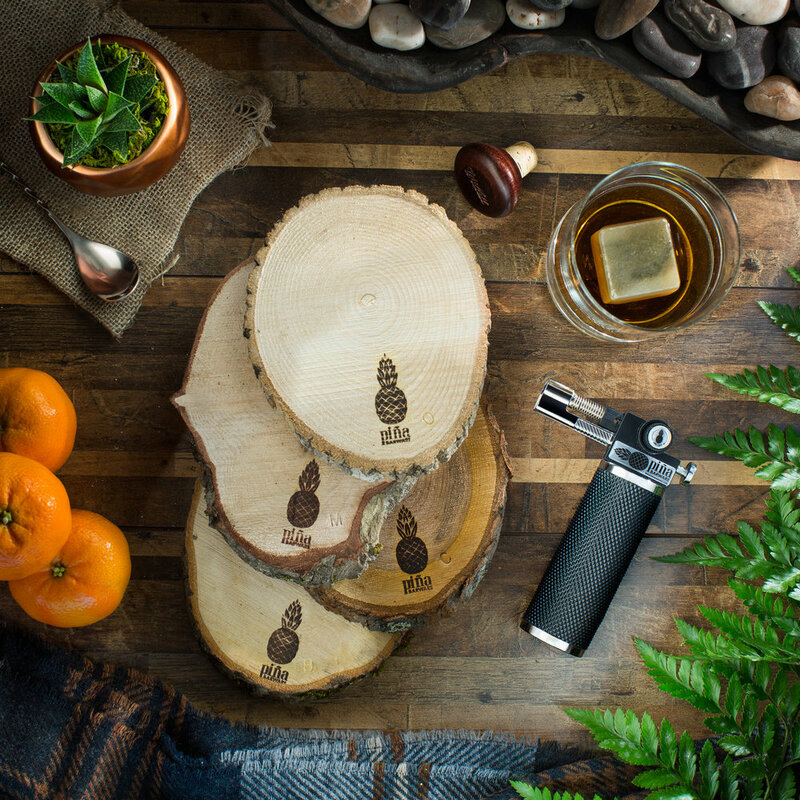 Our home-smoking set is packaged as a kit and is perfect for gifting. Inside, the butane torch is boxed with its own instruction and safety manual. The planks will arrive shrink wrapped with an outer label describing the included varieties. Due to federal shipping regulations, the torch is shipped without fuel.